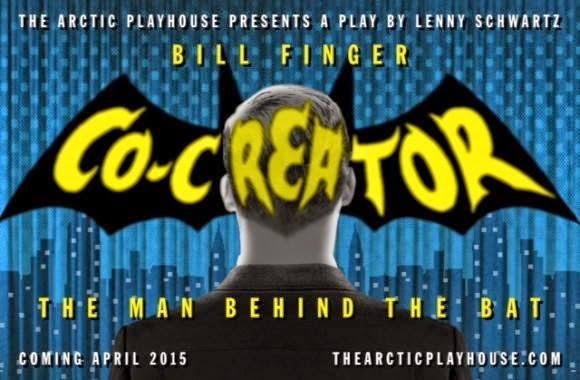 “Co-Creator” is the story of Bill Finger, the unaccredited co-creator of Batman. Bill Finger helped create one of the most popular modern myths with the character of the Bat-Man, as well as the Joker, Robin, Gotham City and many others. He died in poverty and alone, never receiving the recognition he deserved. This is his story. "Co-Creator" runs from April 2nd to April 18th, 2015 at the The Arctic Playhouse in West Warwick, Rhode Island. For more details on dates and times, plus ticket information, please be sure to visit their official website by clicking right here: CO-CREATOR. Also, if you're on Facebook you can LIKE their fan page and, if you do so, then please be sure to share it with all your friends. For the CO-CREATOR FACEBOOK page, just CLICK HERE!